…….. West Delray Updates ……..
Citizen meetings or initiatives about any construction or applications. The website will be divided into newsletters with current information and separate pages for any property in construction or planning. At the current moment, the following properties are in some stage of construction or consideration by Palm Beach County. A. The Atlantic at Delray Beach ( formerly Stonybrook on the Lake), 346 Apartments on Lake Ida Road, between Sims Road and Via Flora. Plans Approved in 2014. Demolition started in October 2015. As of Nov 1, 2016, all buildings on Lake Ida have been roofed and windowed. Interior work started. C. Providence Living in Delray Beach, Congregate Care Facility on Sims Road on the southwest corner with Frost Lane. 144 Beds for Independent Living, Assisted Living and Memory Care. Approved by the County Commission on September 24, 2015. Application # PDD/R-2015-00755. Might start site demolition and clearing in Dec. 2016. 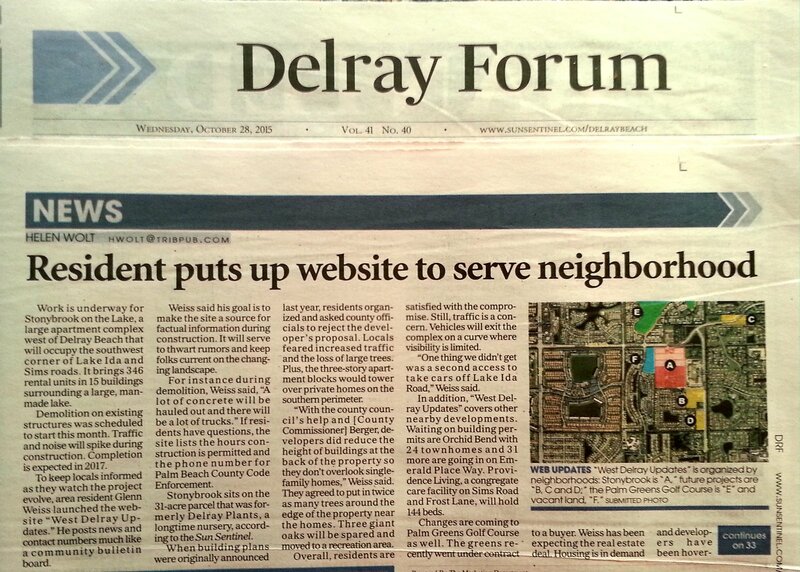 F. Shores of Delray Senior Living, Submitted for Congregate Care Facility on SE corner of Lake Ida and Via Flora. Requested to increase residents from 77 to 170. Submitted 12/16/2015. Application # DOA/R-2015-02530. Zoning approved in August 2016. Project approved. In design by County staff. H. Atlantic and Sims Traffic Light. The new traffic light is under designed with construction in 2017. J. Marina Lakes Golf Course (The Orioles), In August 2016, 13th Floor Homes from Miami proposed a development of homes, townhouses and apartments in the abandoned golf course. Approved Plans and Permits, but no construction planned. D. 14460 Emerald Place Way, 31 Townhouses on Sims Road north of American Eldercare/Grand Villa, Application approved in 2005. The abandoned site was clear in May 2016. B. Orchid Bend, 24 Townhouses on Lake Ida Road between Sims Road and Bridgeview Development. Plans recommended for approval by Zoning Commission on October 1, 2015. Application # PDD-2015-00746. On Nov. 1, 2016, the land is for sale. Redevelopment discussed, but no active plans. Land for sale. E. Villa Del Ray Golf (Palm Greens), Between June 2015 & April 2016, the Wantman Group prepared documents and met with the County for redevelopment of the golf course to housing. As on May 2016, the Wantman Group ceased activity. Golf course ceased operation permanently in July 2016. G. Kamhi Property. In April 2016, the 4.32 acre, wooden property went on the market for $2,950,000 – a redevelopment price. K. Behind Winn-Dixie. In summer 2016, the 5 acre, wooden property went on the market for $1,650,000. 1. Cambria Parc Townhomes by Lennar Homes, 5400 Flavor Pict, Zoning Approved. Started construction in June 2016. With the approval of the penny sales in Nov 2016, Palm Beach County has plans to re-surface and/or re-stripe several roads. NO roads in the area, including Lake Ida, will be widened or changed in the next 25 years according the County Engineer. Click Here for PDF of Poster for Printing. Post at Home, Club House, Business, etc. Glenn Weiss, a resident of Palm Greens, prepares the website. Thoughts, ideas, updates, complaints and anything else can be sent to him at westdelrayPBC@gmail.com. Hey, nice job on the web site. We live on Altocedro and we appreciate the info. Keep up the good work.